The unceasing ebb and flow of the ocean echoes the shifting tides of life. Calm one moment and turbulent the next, the waters may bring the unexpected, but they always crash on the same familiar shore. 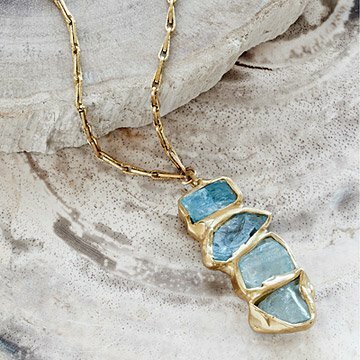 Capturing the multifaceted sentiment that there is unsung beauty in life's imperfect and unpredictable tides, Emilie Shapiro's jewelry collection features generous hunks of lovely yet rough-hewn aquamarine. Each stone is framed by a hand-sculpted brass bezel. Handmade in New York. Make it a set! Pair it with the matching bracelet and earrings. If I could give this ten stars I would. There's nothing subtle or casual about this piece- it's meant to catch and captivate attention and it DOES. It's stunning- an absolute treasure. I'm so glad I purchased this! Disappointed with the color of the brass and stones. The color of both, brass and stones were nothing like the picture in the website. Brass is too dark and stone were more gray than blue. Aqua is my favorite color but the stones were blue. I realize that's the luck of the draw. The chain was much too delicate for the necklace. The metal surrounding the stones was quite heavy. A chunkier necklace would have been much more suitable. People with arthritis of the hands will have a very difficult time with the clasp. I intend to take my pendant to a local jeweler to have the clasp changed so that I can attach a magnetic closure.